MTB Friendly accommodation around the Long Mynd, Bishop’s Castle, Church Stretton and the surrounding hills has plenty of accommodation on offer, ranging from hotels and guest houses to self catering holiday lets and campsites. A full list of providers can be found on the Bishop’s Castle & Church Stretton websites. A few highlights that we have found offering bike friendly facilities are detailed below. Where to stay for the Batch Burner near Norbury on the West side of the Long Mynd shown with BB2: number equates to distance from start. Victoria House, Bed and Breakfast, Church Stretton, (07772 273325) bedandbreakfast-shropshire.co.uk Visit England Cyclists welcome award. Visit England Cyclists welcome award and have secure cycle storage. The Long Mynd Hotel, Church Stretton, (01694 722244) longmynd.co.uk offering hotel rooms and self catering lodges. Also offer activity break packages plus secure cycle storage. 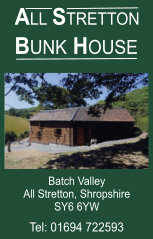 All Stretton Bunk House, All Stretton, Church Stretton (01694 722593) allstrettonbunkhouse.co.uk Offers self catering bunk house accommodation with secure cycle storage. Womerton bunk house, All Stretton, Church Stretton (01694 751260) womerton-farm.co.uk Located on the Mynd. Ideal for big groups, power washer and cycle storage. Bridges YHA, Ratlinghope, (01588 650656) yha.org.uk/hostel/bridges Has a cracking pub next door that was the venue for the 2012 and 2013 Yetifan Tribe meet. Please contact us to have your link added.